Of the many ways we express our holiday spirit each year, few are as personal - and as beautiful - as the prized ornaments we choose to display on our Christmas trees. 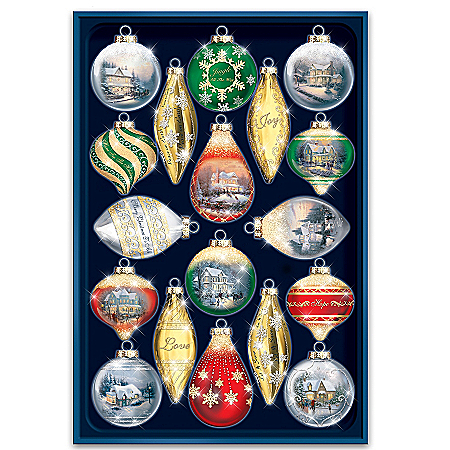 Now, let the beloved holiday art of Thomas Kinkade transform the look of your tree year after year with the Thomas Kinkade Shimmering Splendor Ornament Set, our first-ever 18-piece heirloom glass ornament set, exclusively from The Bradford Exchange. Crafted in 5 traditional ornament shapes, from classic round to elongated teardrop, this dazzling set of ornaments gleam with both shiny metallic finishes and lustrous satin finishes in favorite holiday colors!Each of the heirloom glass ornaments in this set is hand-blown so no two are exactly alike and is adorned with glitter, raised-relief snowflakes and other holiday motifs. 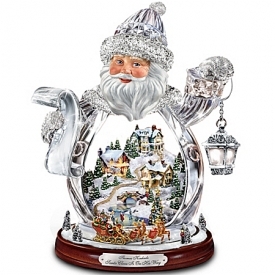 Nine glass ornaments showcase Thomas Kinkade's best-loved holiday scenes, including "Victorian Christmas" and "Home for the Holidays", while the other nine share holiday themes and phrases that capture the spirit of the season, including "Jingle All the Way", "Peace on Earth", "Love" and "Joy". 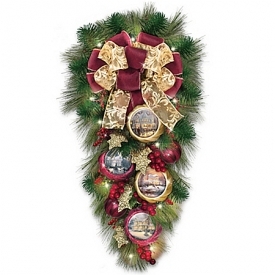 Plus, this 18-piece ornament set arrives together in a custom-made Heirloom Collector's Box featuring a debut composition of Thomas Kinkade's holiday art on the cover. 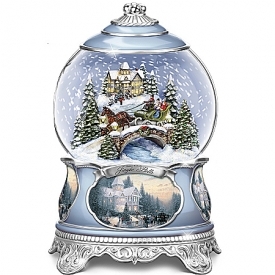 Strong demand is anticipated for this limited-edition Thomas Kinkade Christmas ornament set, so don't delay. Order now!